I had a new year’s resolution never to mention Einstein in my posts again. Never say never again! I have a new resolution. I will mention his name as part of physics exposition but I will no longer comment on his personal history. This is the last post of that kind. When I wrote a post about the strange fact that Einstein was awarded the 1921 Nobel Prize in physics in 1922, I did not mention the winner of the physics Nobel Prize in 1922. It was Niels Bohr. 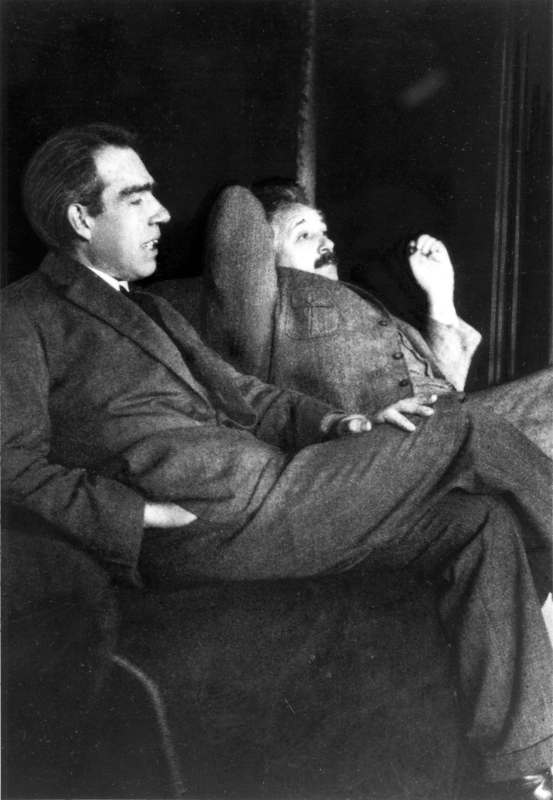 There is extensive historical research about Bohr-Einstein debates particularly about their debate during the 1927 Solvay Conference. Bohr played a leadership role in the development of Quantum Mechanics. Einstein is the sole discoverer of the Relativity Theory. There is tension (not conflict) between the Quantum Mechanics and the Relativity Theory. I wrote a post about this tension. Clearly, the tension between the theories caused tension between the two men as well. According to Antonio M. Gonzales there was mutual admiration rather than tension between the two men. This view is contradicted by Hans C. Ohanian in his book titled “Einstein’s Mistakes“. In 1949 – the year following Bohr’s four month visit to IAS in 1948 – a book specially prepared to celebrate Einstein’s 70’th birthday appeared in print: “Albert Einstein: Philosopher-Scientist” from The Library of Living Philosophers Series (edited by Paul A. Schilpp). The book was a collection of essays explaining the importance of Einstein’s contributions to physics, and his own impressions on his life and work. In this book Neils Bohr has a report of his conversations with Einstein in the past. Interestingly, in the same book there is Einstein’s reply which demonstrates that Einstein still had a sharp mind at the age of 70 and he was still thinking about quantum mechanics. This entry was posted in history, philosophy, physics and tagged Albert Einstein, Niels Bohr, Quantum mechanics, Theory of relativity. Bookmark the permalink.